A brief history of Traditional Blue Ridge Music. Women’s stringband, circa 1940s. Ferrum, Virginia. Settlers in the Tidewater region of the New World did not anticipate the flowering of new musical styles in the mountains that lay to the west. The powerful Cherokee tribe inhabited the southernmost part of the region and the Cherokee, Shawano and other tribes used the middle and upper areas as hunting grounds. Some colonists feared conflict with the Indians and dangers associated with isolation if they ventured into this frontier region. To those who sought land, however, the Blue Ridge represented opportunity. 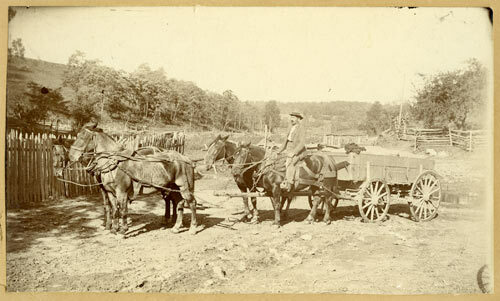 Four-horse wagon team, late 1800s or early 1900s. Rockbridge County, Virginia. Approximately one hundred years passed after the founding of Jamestown before colonists began to immigrate en masse to the region. The Great Wagon Road--or Valley Road, as it was called in Virginia--proved to be the best way into the mountains. The Valley Road followed old Indian trails for some 700 miles, starting near Philadelphia and running down the Shenandoah Valley. Near what is now Roanoke, Virginia, some travelers turned south along the Carolina Road into the Piedmont of North Carolina and South Carolina. Others continued into the mountains of Southwest Virginia, east Tennessee, and beyond. In 1730 a community of Germans settled an area near what today is Luray, Virginia, in the Shenandoah Valley. The Germans were followed by English Quakers, who were followed by Scotch-Irish, French Huguenots, Irish, Welsh, and more English. African American slaves were brought into the Blue Ridge by some of these settlers. Other African Americans came with owners who moved into the region as Tidewater lands were worn out by the unrelenting planting of tobacco. By 1805, a year in which the population of the entire nation was only two million, as many as 10,000 travelers passed through Abingdon in the southwestern corner of Virginia. By some estimates, fully one-fourth of the present population of the United States has ancestors who used this route to move westward. 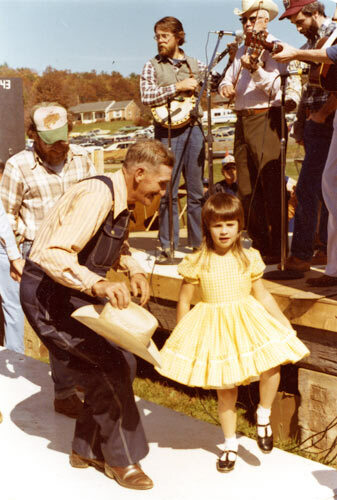 Flatfoot dancing at the Blue Ridge Folklife Festival, circa 1979. Ferrum, Virginia. Groups traveling the Valley Road brought cultural traits and skills from many homelands and from diverse sections of those lands. A few of these traditions have survived to the present day, but most cultural attributes blended with those from other cultures and changed into something altogether new as people moved and settled together. The musical exchange among these groups proved particularly potent. Perhaps the Blue Ridge insulated its inhabitants from the more rigid class distinctions and elite cultural practices adhered to by planters living in the East. Virginia settlers could see London from Baltimore or Richmond but not from Gap Creek or the Meadows of Dan. The old authority did not reach that far, and fresh ideas, including ways of thinking about and playing music, flourished in this environment. 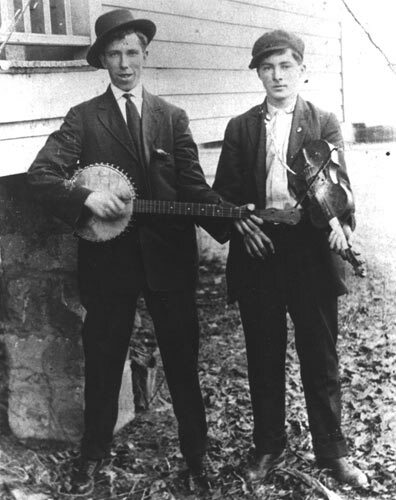 Banjo player and fiddler, 1912. Endicott, Virginia. The fiddle and banjo ensemble, the core of the mountain string band and the symbol of Blue Ridge music for many Americans, is a prime example of a new flavor that emerged from the cultural stew simmering in the region prior to the Civil War. The fiddle was novel and exciting when Europeans first brought it to North America during the late seventeenth century. It was replacing the hornpipe, tabor, and harp at country dances and other rural social gatherings in the Old World. 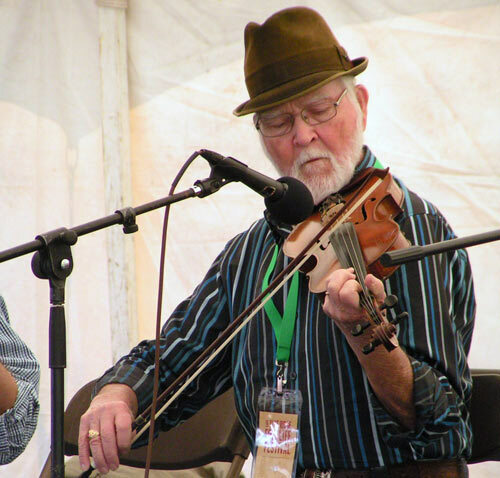 Sam Wood playing fiddle at the Blue Ridge Folklife Festival, 2011. Ferrum, Virginia. Part of the excitement resulted from improvements to the instrument and its increased availability. European luthiers such as Antonio Stradivarius of Cremona and Jacob Stainer in the Tyrol innovated construction techniques that gave the instrument a deeper tone and greater projection. New wealth from the tobacco trade allowed Virginia planters to purchase violins by these makers or good copies of their instruments. Perhaps one of these fiddles constituted the prize described in an announcement appearing in the Virginia Gazette in 1736; spectators were invited to hear twenty fiddlers in Hanover County, Virginia, compete for a fine violin. Black slaves and white indentured servants did much of the music-making at Virginia dances, and Virginia Gazette advertisements for runaways sometimes mentioned that the escapee was a fiddler. Virginians seeking to acquire slaves and indentured servants sometimes specified that in addition to the usual qualifications they wanted a musician. 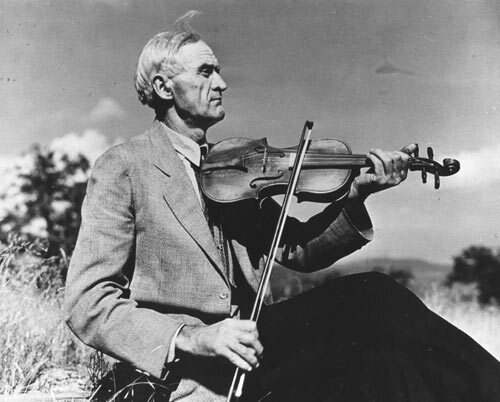 Fiddlin’ John Powers at the White Top Folk Festival, circa 1939. White Top, Virginia. By the beginning of the nineteenth century, fiddles could be found in settlements throughout the Southern Appalachians, including Cherokee communities. Captain John Norton reported in his 1809 travel journal that Cherokees were playing fiddles and doing "English dances." Fiddles were played in people's homes for dances and for pleasure, at community work gatherings such as cornshuckings and bean stringings, for special celebrations such as the last day of the school year, and at contests and fiddlers conventions where musicians vied for awards and recognition. 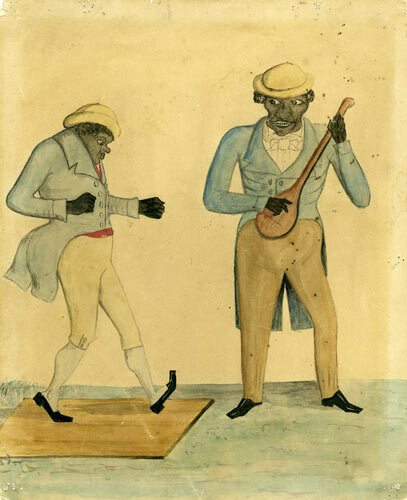 Watercolor of African American banjo player and dancer, first quarter 19th century. Artist and location unknown. The banjo has a far different lineage. No one knows exactly when the instrument first came to North America, but there is no doubt about its roots. Banjo-making skills were introduced into the New World by West Africans brought here to work on tobacco and sugar plantations. The instrument had existed in a bewildering array of forms in Africa for hundreds of years. President Thomas Jefferson, a fiddler himself, seemed to have had his hands on a banjo because he described the instrument and how it was tuned in his book Notes on the State of Virginia. Jefferson said of black residents of the Blue Ridge, "The instrument propoer to them is the banjar which they brought hither from Africa." Josh Thomas playing banjo at his home in 1969. Hollins, Virginia. Photo by Clifford Endres. African Americans playing the African-style banjo and the European fiddle formed the first uniquely American ensemble--the root of the root, the beginnings of a sound that would eventually shape blues, bluegrass, and Country & Western music, among other genres. 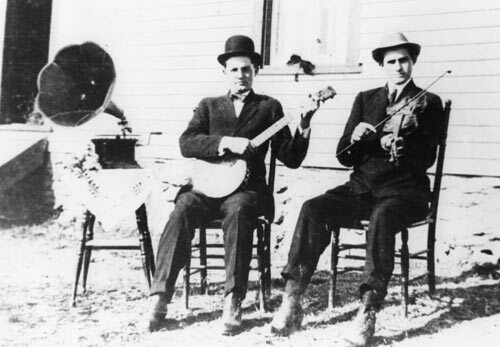 Generations of travelers reported that black fiddle and banjo players, often performing with players of rhythm instruments, provided music for dancing in many areas of the Southeast. 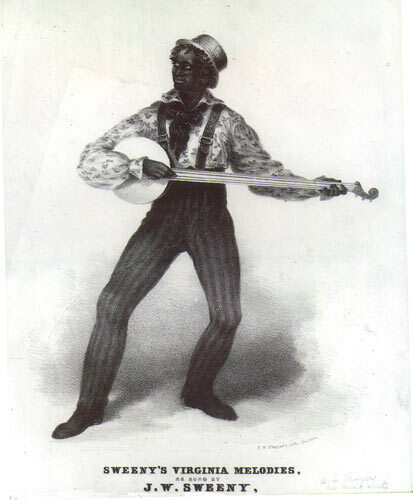 Promotional graphic of Joel W. Sweeny, international minstrel star from Appomattox, Virginia, circa 1840s. It is uncertain when whites took up banjo playing, but after 1800 the instrument was used by white comics who impersonated black banjoists, creating racial caricatures by wearing ragged clothing and blackening their faces with burnt cork. 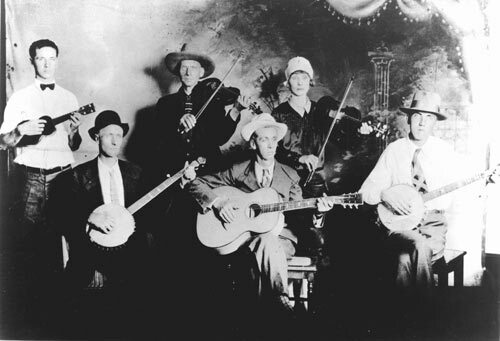 They told jokes, sang comedy songs and performed tunes such as "Turkey in the Straw" and "Arkansas Traveler" on banjo, fiddle, hand drum, and bones. Some of these performers worked in early circus troops and were playing for Blue Ridge audiences by the early 1840s. These artists initiated the first international pop music fad, the so-called minstrel era, which lasted until the end of the century. 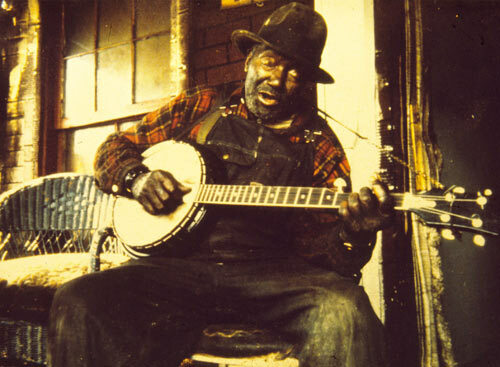 During the heyday of minstrelsy, the banjo, a traditional instrument once used solely by country people, was adopted by urban players who could afford fine instruments. Banjo construction improved and the instrument as we know it today was created. 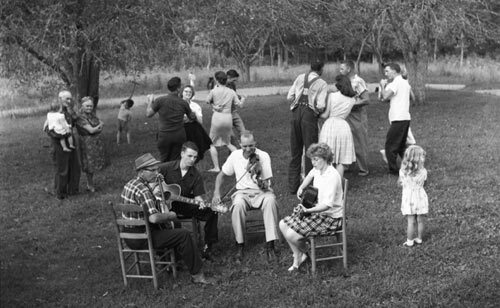 Outdoor square dance, circa 1960s. Woolwine, Virginia. Photo by Earl Palmer. Like all fads, minstrelsy passed, but it left much behind in the Blue Ridge. Many mountain square dance tunes have minstrel roots. The banjo, the main prop of the minstrel performer, found its way into the mountains and in tandem with the fiddle became the core of stringband music. The people of Middle Appalachia, including the Blue Ridge range, began to attract the notice of the popular press shortly after the Civil War. Many journalists relied on a vivid imagination rather than accurate reporting of mountain ways. By the 1920s the term "mountaineers" conjured up a widely recognized stereotype of uneducated, fiercely independent people, often feuding and living in clans in remote hollers. This pervasive notion of isolation colors public perception of the region's traditional music. Many believe that the relative inaccessibility of mountain communities has preserved music in an unchanged, and even primitive, state over generations. The most romantic version of this theory imagines mountain music as a holdover of the ballads, reels, and pipe tunes of the British Isles. The influence of African American music and the minstrel stage demonstrates that the Blue Ridge was far from isolated, even in the early nineteenth century. Music in the region was shaped by other national events and trends. A few of these are worth noting. 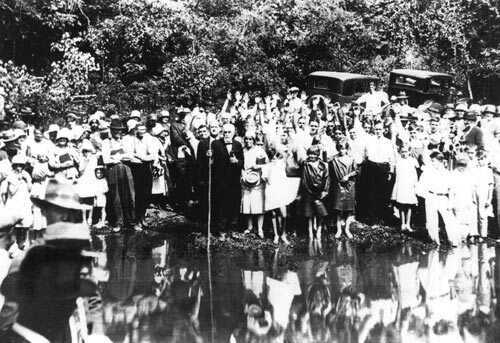 River baptism service, 1930. Franklin County, Virginia. A wave of religious revivals that swept the South at the beginning of the nineteenth century reached deeply into the Southern Appalachians. The songs associated with this "Great Awakening" became a permanent part of the repertory of many church congregations in Virginia and North Carolina. The middle of the nineteenth century witnessed one of the cataclysmic events of American history, the Civil War. Loyalties were divided in the mountains of western North Carolina and Virginia, and communities witnessed conflicts between families and neighbors who chose different sides. Traditional songs that found their way into the region express this division. Ballads such as "Lincoln Was a Union Man" promoted the Union's perspective, while "Bright Sunny South" conveyed southern sympathies. Despite its divisiveness, the Civil War seems to have expanded the repertories of Blue Ridge musicians. Soldiers from the mountains traded tunes with fiddlers and banjo players from other parts of the South and learned pieces played by regimental bands. After the conflict ended, mountain musicians also brought home songs and tunes composed to commemorate battles or convey the experiences of wartime. 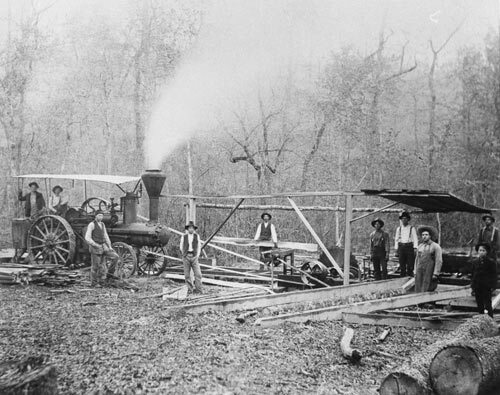 Sawmill powered by a steam engine, circa 1900. Patrick County, Virginia. In the late 1800s logging and mining companies expanded operations in the Blue Ridge and Appalachian Mountains. Laborers from across the region were hired to work in the mines and log the forests. Camps created to house and feed the workers became fertile ground for swapping tunes. Large-scale mining and logging required the construction of railroads into the mountains. The employment of African American work crews to lay track and drill tunnels introduced worksongs and ballads such as "John Henry" and "Swannanoa Tunnel" to mountain musicians and audiences. 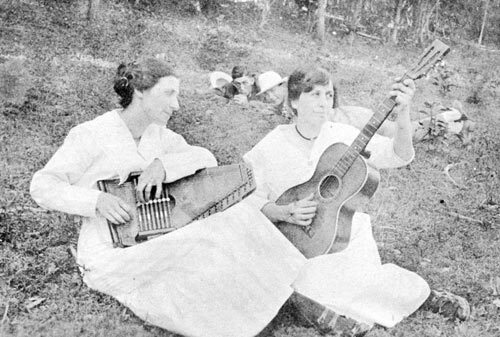 Unidentified autoharp player and guitarist, 1917. Patrick County, Virginia. By the turn of the twentieth century, mountain residents could buy merchandise made available to the national market by large mail-order companies. In addition to tools and clothing, they ordered instruments from Sears Roebuck and Montgomery Ward. Guitars, mandolins, autoharps, and cellos, mass produced and easily accessible, were combined with fiddles and banjos to form larger stringband ensembles, the precursors to the old-time and bluegrass bands so pervasive in the region today. Unidentified banjo player and fiddler with phonograph machine, circa 1920s. Franklin County, Virginia. In the 1920s the growth of commercial radio and the record industry brought traditional Blue Ridge music to a national audience. To their surprise, urban record company executives discovered a market existed among rural residents for stringband music (as well as “hillbilly”-style sentimental songs, ballads, gospel, and even blues). The promotions devised to sell traditional music drew upon the stereotype of isolated mountaineers who had preserved the "old-time" music. Recording stars Ernest Stoneman and the Dixie Mountaineers in Galax, Virginia, 1928. Although many musicians from the Blue Ridge were recruited to make records, most made only a handful of recordings. A few, such as Ernest Stoneman (Galax, Virginia), J. E. and Wade Mainer (Buncombe County, North Carolina), and the Carter Family (Maces Springs, Virginia), had prolific recording careers and shaped the beginnings of Country & Western music. These recording artists also influenced their neighbors in the Blue Ridge. Their playing styles and repertories began to supplement, and sometimes replace, local styles and tunes. About the same time that commercial labels were recording Blue Ridge musicians for profit, collectors interested in cultural preservation were scouting the region to document traditional music. British scholar and folksong collector Cecil Sharp was one of the first. He journeyed to the Blue Ridge at the time of the First World War to take down the words and music of old ballads (songs that tell stories). Sharp was captivated with the quality of the music he heard and was surprised by the fact that people of all ages knew songs. In his English Folk Songs of the Southern Appalachians, Sharp described some communities in the Blue Ridge as places where "singing is as common and almost as universal a practice as speaking." 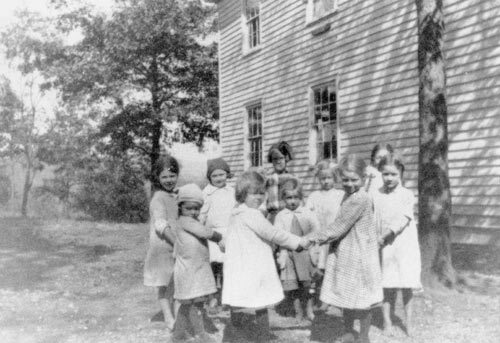 Girls playing a ring game at St. Peter’s in the Mountains, an Episcopal mission school, circa 1914. Callaway, Virginia. Other music scholars and collectors followed Sharp. Their field recordings, along with those made by record companies, constitute a treasure trove of ballads and love songs, dance tunes, children's songs, hymns, spirituals, and gospel songs. Over the years many people have plumbed this archive. Aaron Copland, perhaps the nation's best-known composer, interpreted traditional fiddle tunes in his classical works as a way to express the American spirit and cultural identity. Mining from Blue Ridge traditions, a performing group named The Kingston Trio drew upon an obscure ballad collected from singer Frank Profitt of western North Carolina for their 1957 hit recording "Hang Down Your Head, Tom Dooley." The success of this song helped launch the national folksong revival of the 1950s and '60s, and some Americans who were part of this movement became interested in the source of the songs. 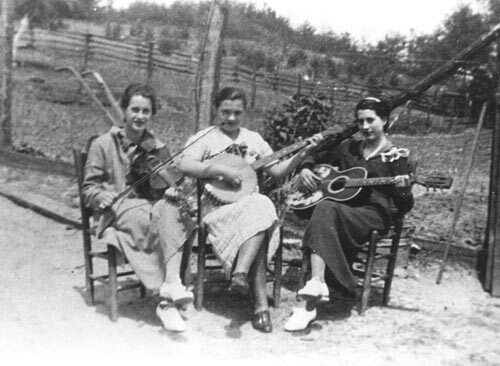 Young urbanites began to visit the Blue Ridge to find old-time and bluegrass musicians. They made recordings and films of traditional artists and introduced mountain musicians to college and city audiences. Some were inspired to learn to play the music they heard performed in concerts or issued on recordings. 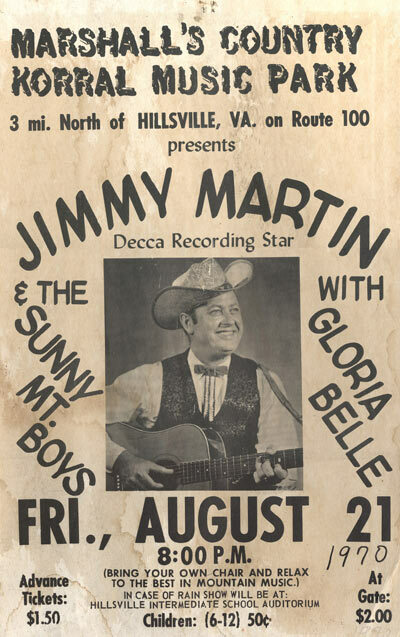 Promotional poster featuring Jimmy Martin & the Sunny Mt. Boys at a bluegrass concert near Hillsville, Virginia, 1970. During the late 1960s large numbers of outsiders began to attend music events held in the Blue Ridge region. Fiddler's conventions and bluegrass festivals attracted crowds of young people motivated by the desire to hear music, learn tunes, or be part of a huge party. Aspiring musicians from across the nation as well as Europe and Japan continued to visit Blue Ridge music venues during the last quarter of the twentieth century. Musicians such as North Carolina’s Tommy Jarrell and Virginia’s Kyle Creed became musical role models for thousands of people who grew up outside the region. In the Blue Ridge, as in nearly all places in America nowadays, one can find fans and performers of almost any type of classical, contemporary, pop, and alternative music. In addition, recent immigrants from Mexico, Central America, and Asia are bringing their musical tastes and preferences to the region. In this mix the established traditions of the Blue Ridge continue to thrive and evolve. Stevie Barr & the Mastertones performing at the Blue Ridge Folklife Festival, 2014. Ferrum, Virginia. Today the Blue Ridge still harbors a fine array of stringbands. The bands playing so-called “old-time” perform a largely older dance music repertoire. Bluegrass bands, which evolved in part from that tradition over the last 70+ years, play music intended more for listening than dancing. Singers of the older Anglo-Irish ballad repertoire still live and perform in the region, and classic sentimental mountain lyric songs are widely sung. A variety of white and black churches draw heavily from longstanding traditional music styles. In addition, the Blue Ridge is home to a vigorous tradition of making musical instruments, mainly fiddles, banjos, guitars, mandolins, and dulcimers. The nation's best musical instruments are handmade, and some of the finest are made in small woodworking shops in the region. Importantly, many young people growing up in Blue Ridge communities are learning to play the music passed down in their families and communities. They learn through informal apprenticeships with relatives and friends, by attending community musical events, or by taking more formal lessons offered in after-school programs in some of the public schools. 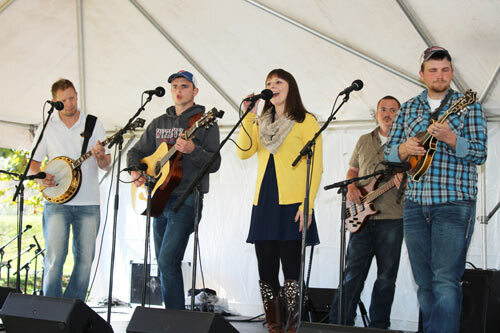 Several area colleges offering traditional music camps and workshops provide scholarships to promising young musicians in the region. While Blue Ridge performers—Doc Watson, Etta Baker, Sammy Shelor, and Wayne Henderson, just to name a few—have taken the region’s music to audiences across the country and around the world, the stream of visitors continues to journey to the North Carolina and Virginia Blue Ridge to hear the music in its homeplace. People from outside of the mountains come to get closer to the traditions and the growing community of revivalist musicians. They bring new musical ideas and styles that are attracting an enthusiastic young audience to the music. For listeners and pickers of all ages, the music of the Blue Ridge continues to inspire. Text and images from this site may be downloaded for personal, noncommercial, educational purposes only and must be credited to the Blue Ridge Institute & Museum of Ferrum College. Written permission from the Blue Ridge Institute & Museum must be obtained for publication or use of text or images from this site outside of the purposes stated above.This online exhibition has been created by the Blue Ridge Institute & Museum of Ferrum College (BRI), collection of the BRI, and the text has been written by BRI staff or project consultants. If you have reason to believe that any material or activity on this site is infringing rights owned by you or someone else for whom you have authority to act, please contact the Blue Ridge Institute & Museum.